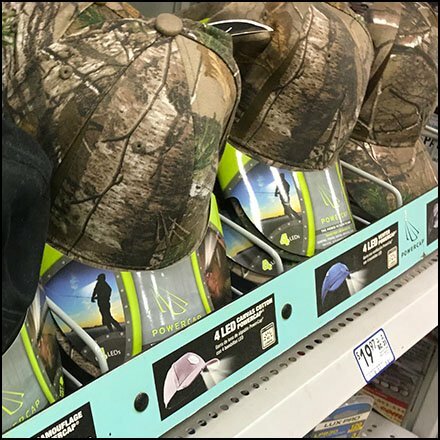 This state-of-the-art LED headgear obviously warrants a state-of-the-art Shelf-Top Rack for Outdoor Cap Sales. Facings are sized to suit via open wire dividers. The display commands an entire shelf to present its 5 head-covering and lighting options. A preponderance of camp-color offerings might hint at an outdoorsman and hunter market … or just male color and ego-driven choice. This Shelf-Top Rack for Outdoor Cap Sales seen at Lowes. “Cap and Hat Store Fixtures Pinterest Board“ for a visual summary.